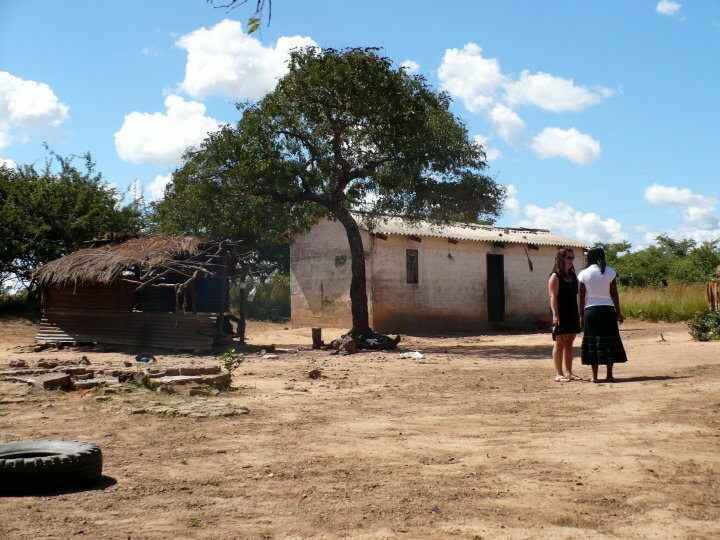 In April 2010 I took part in my first volunteering project at Antelope Park, based in Gweru in Zimbabwe. When I announced my decision to friends and family their emotions were mixed. I heard why am I going to the middle of Africa and if I lost my mind to handle the lions… YES, you read well. And before you assume anything – read the full article. The issue of lions, politics, and volunteering in Africa and is way more complex than just a simple it’s good or it’s bad. After a lot of cases describing animal abuse in Asia and recently, unfortunately, in my beloved South Africa, people have an impression that EVERY animal activity is bad, what isn’t always the case. Some places in South Africa started using lions, just like elephants are being used for rides in Asia. 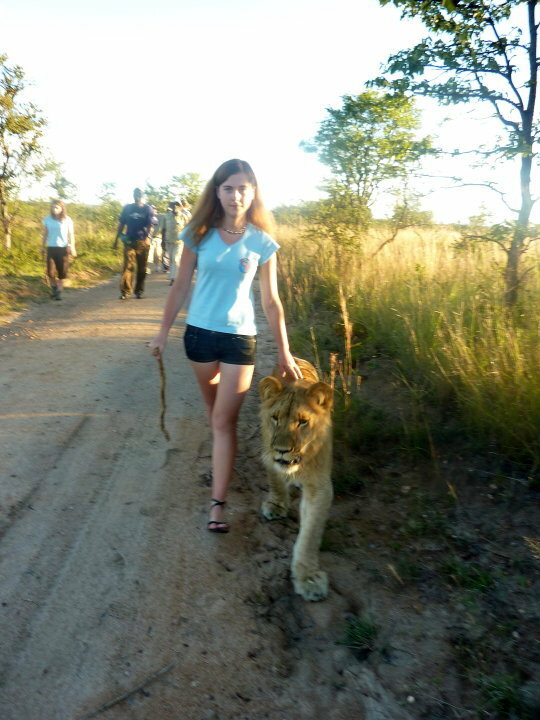 It comes as no surprise that every animal contact and especially lion walks are considered bad. The lion population in the last 30 years has declined by 80%-90%, from an estimated 450,000 down to 20,000-30,000. Why aren’t all lions being released into the wild? Unfortunately, not all lions can be released into the wild. There are various reasons for that. They could have come from a place where they got abused and never learned how to hunt. A release would ultimately mean a death sentence for them. But that’s not all. In the last few years research has shown that most of the lions left in the wild are infected with potentially fatal diseases. Not to mention hunters paying bribes to shoot lions, even in national parks. Therefore, similar to the case of white rhino that requires 24/7 guarding from hunters, lions need to be protected too. It’s sad, but it’s true. “ALERT has no intention of releasing captive-bred, human imprinted lions into the wild. 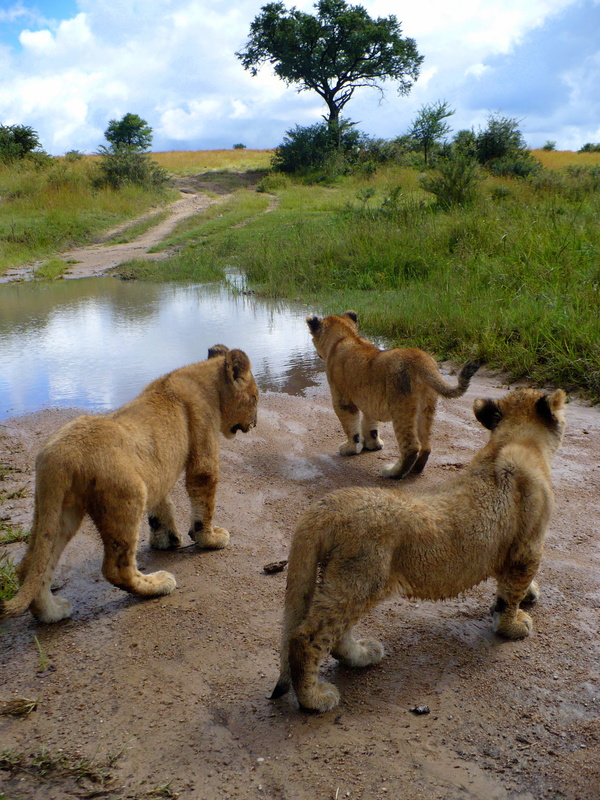 Rather, captive bred lions undertake pre-release training on lion walks that tourists may choose to join, to enable their release into fenced natural areas. In these release sites, the pride raises cubs free of human contact. It is these cubs that are intended for release into the wild.” Read more here. When the plane started approaching Bulawayo airport I thought ‘Are we really going to land here?’ It was nothing there, just a grass field. 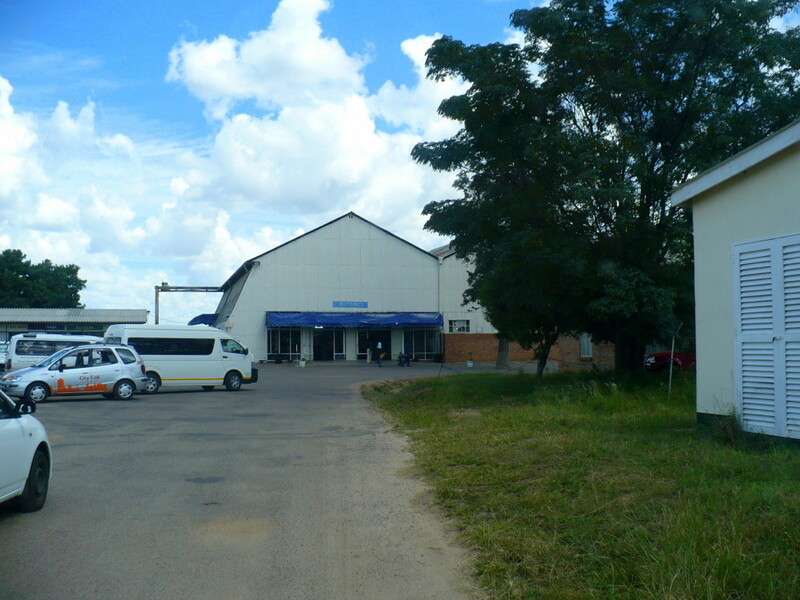 Later on, I’ve realized that Bulawayo airport looks like an abandoned shed with two entrances with no doors, supposedly for departures and international arrivals. The next morning I had to take a bus to Gweru by myself. Surprisingly, the bus was much more comfortable than American buses. Sam – the lion project manager picked me from the station with his truck explaining me everything about the handlers working in a park. He told me about their funny names like Lovemore, Jealous, Bigboy. In Zimbabwe even ‘Iloveny’ is a name when the parents saw one of the famous American ‘I love NY’ T-shirt. Antelope Park is specialized in breeding lions, that are slowly becoming extinct in Africa. Obviously, it’s main mission is to help lions survive, working directly with Lion Alert mentioned above. However, the park earns money on its unique range of activities, such as lion walks, elephant swims, and African horse rides. Where does the money go? I won’t tell you it goes to the lions 100% as in the end of the day it’s a business, but a huge part of it does. This is when my role came along. Note: Elephants are orphaned and that why they’re semi-wild (in an enclosed 3000-acre game park with natural environment). They’re free, come and go as they please and NEVER carry a heavy seat to ride tourists, no weapons and hooks to harm their skin etc. They might, however, approach you and handle you a dry lion poop – I was told a sign of appreciation. As a volunteer, I was involved in a bunch of activities. The main activity, however, was taking lions for a walk starting early in the morning: no collars, no leashes, no enclosures. It’s an unforgettable feeling when the lions were coming to me behaving like kittens – touching with a head, walking around the legs without leashes and reacting when I called them by name! There was no fear coming from volunteers because they were not going to bite, they were listening to people. Moreover, we were supposed to prepare meat for younger cubs and feed them with a baby bottle. These lions were not to release in the wild. 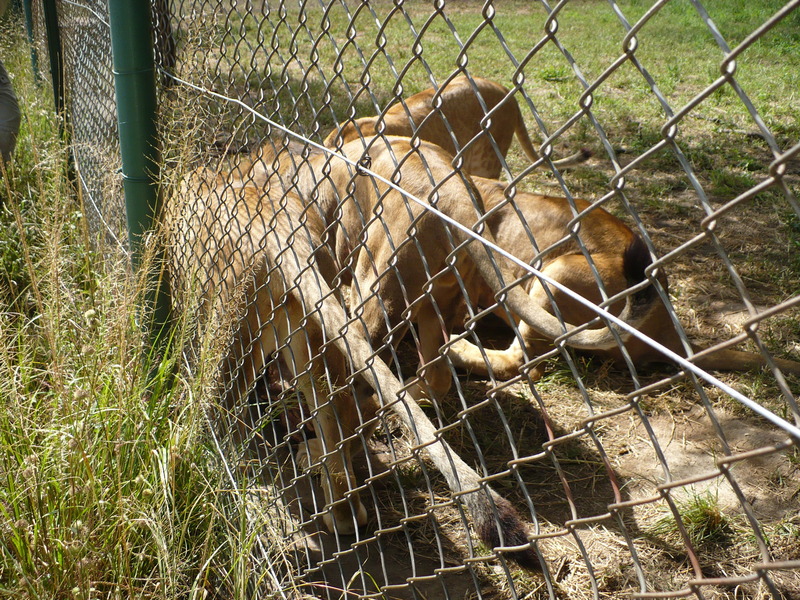 There were two abused lions brought to the park from another place and were afraid of everything. Whatever happened to them before, it definitely wasn’t right, as poor lions couldn’t even handle a zebra passing by in the distance. Every day we were sitting in their enclosures trying to play with them with lion’s favorite toy – a dry elephant poo wrapped in leaves. Volunteer’s duties also included delicately speaking dirty activities – like cleaning the enclosures or repairing fences. 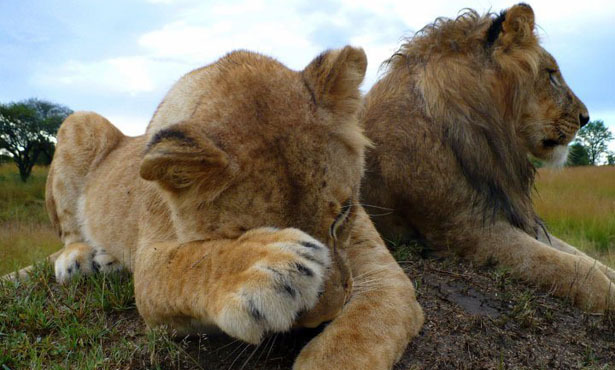 Believe me, lion’s poo stinks very, very bad! 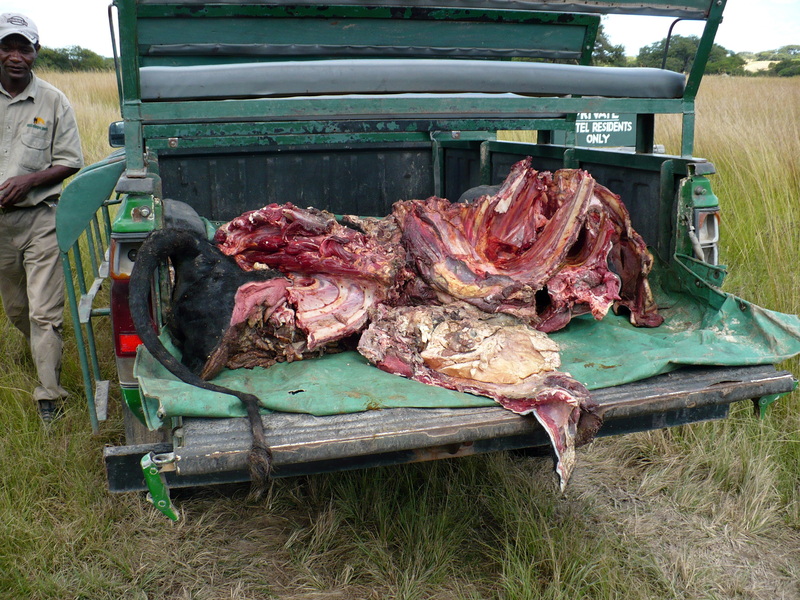 An interesting activity was also meat preparation… that was basically chopping the whole cow into pieces for those lions not to be released into a free space and therefore non-hunters. And… the meat is gone! Lions I’ve worked with aren’t abused, kept captive, and it was not a ZOO. Nobody posed with lions for photos against their will. They’re also not trained or drugged to pretend that they like it. And while tourists could interact with the lions, it was their (lions) decision, not humans. However, the current state Antelope Park is questionable. 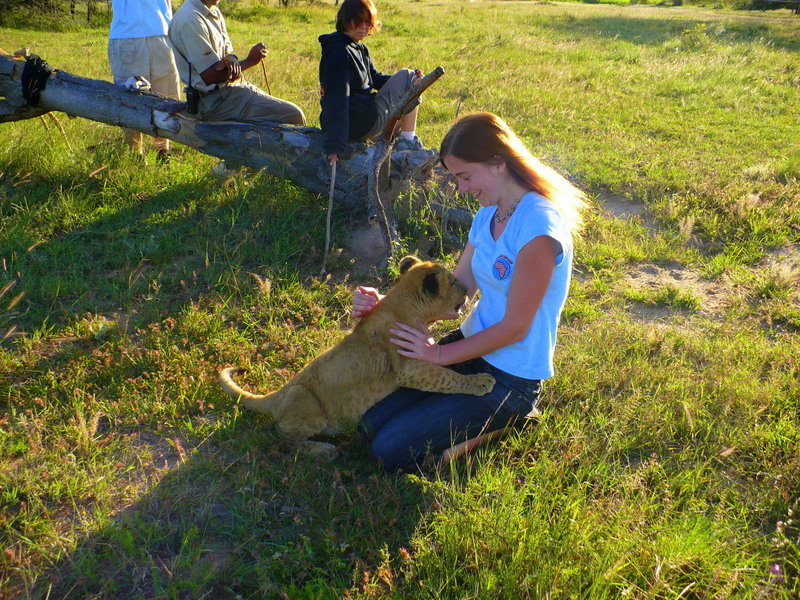 Back in 2010 when I visited, things seemed fine in terms of handling the lion program. But 7 years later, there are much confusing information online which caused an endless battle, and I’m not sure if I could make up my mind and say whether it’s legit or not anymore. What I can see that Zimbabwean Tourism does support some bad activities, while Zambian Tourism Board suspended all encounters after being bombarded with social media attack. What I can say though, is that if you want to donate money to a good cause support GG Conservation. I know trusted people there and I can vouch for it being legit. Every Sunday all volunteers were going to visit a local town of Gweru to meet locals. 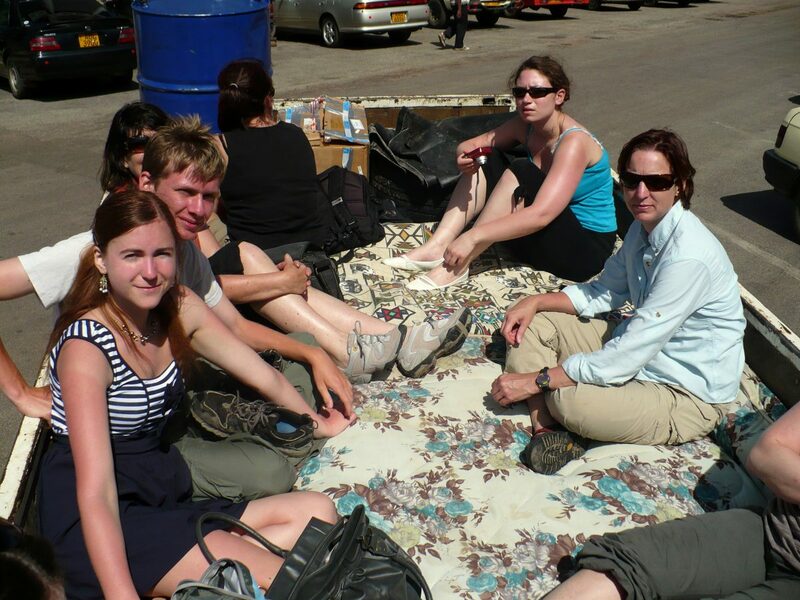 We had some mattresses on the truck, but it didn’t help jumping on it on every whole of the Zimbabwean road. However, it seemed like we became the biggest attraction for the people in Gweru – a group of white people on a meat truck driving through town. Heading to town on a meat truck! But that’s not what I wanted to talk about. Zimbabwe is an amazing country, with even greater people. Unfortunately, the political situation in the country isn’t good. But that’s just the top of the iceberg, at least in my opinion. I might be totally biased, but that’s not Zimbabwe’s only problem. After endless conversations with locals, I realized that the government is one thing, but the presence of British-Zimbabweans is another issues. One would say that these people, some born and raised in Zimbabwe, are locals too. And they are, but their lives are way different than an average black citizen of Zimbabwe. White people keep using black people to work for them, underpaying them a lot. Some people were paid as little $2 per week to work in terrible conditions, in order to serve white people. They can’t protest, they can’t complain as they have families to raise. But this treatment surely isn’t ‘fair’ to them. I was invited to the house of a woman who worked at the park. When we got there it turned out it’s not actually a house, but two sheds for over 20 people to live in. Compare it to giant villas with even bigger swimming pools where white immigrants in Zimbabwe live. However, for a very long time, I haven’t seen people that happy as those two families living there. With a smile on their faces, these they served each of us a slice of bread with jam while cooking sadza – traditional Zimbabwean meal, and scud – local beer. During the meal, I had to sit on the ground to respect the tribe customs. Women sit on the ground while men get a place on the bench. After the meal, some women started playing some music on hand-made instruments. We were all taken to dance and sing with them for the rest of the afternoon. Those people seemed to be the happiest family on the planet earth. Would I go back to Zimbabwe? Yes, definitely, but probably not on an organized trip. I’m aware that if a Western company arranges a safari to Victoria Falls, or any other place of interest in the country, local workers will not be paid much for that. The government will get some part of the money and the rich British will take the rest. Is Zimbabwe alone in this? Nope. I experienced a similar issue in Sapa region of Vietnam (when people of Hanoi were using them) and the most obvious example: Cuba. What are your thoughts on Zimbabwe and lion controversy? Why Did I Travel to Eritrea? It’s an amazing experience, did you end up volunteering? Looks amazing! Do you think lions are happy there? I just arrived from elephant camp in Thailand (and I am writing post on my blog about that in this moment :)) and I have both – negative and positive – thinking about keeping wild animals in some parks, camps etc. Other question – did you have to pay for that? Lions are definitely happy there. I think the big difference between Asia and Africa is that in Asia they just wan tto get your money and abuse the animals 🙁 The park is for protection of the lions, because of some idiot Chinese companies who capture them for cosmetics – the same thig happens with the rhinos. You pay for your own accommodation and meals yes, but to be honest I would pay again as it was incredible! If they are successfully breeding lions, however, than that is wonderful. Hopefully your money from volunteering is funding some good work. I’d love to know if they are releasing any back into the wild, although they couldn’t do this with any humanised animals of course, which raises the question, what happens to these lions when they are too old to walk with people? You also mention riding elephants. Surprisingly this can be damage their backs and is frowned upon by responsible travel experts. Ethics aside, you have some adorable pictures here. 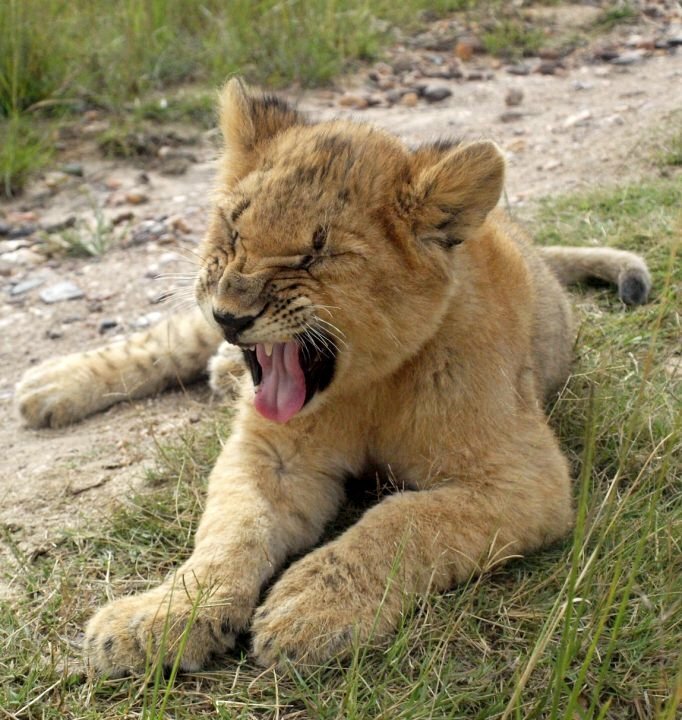 The lion cubs are extremely cute and I can understand why you would want to spend time with them. Do shout though if you’d like any more info on any of the issues I’ve mentioned. 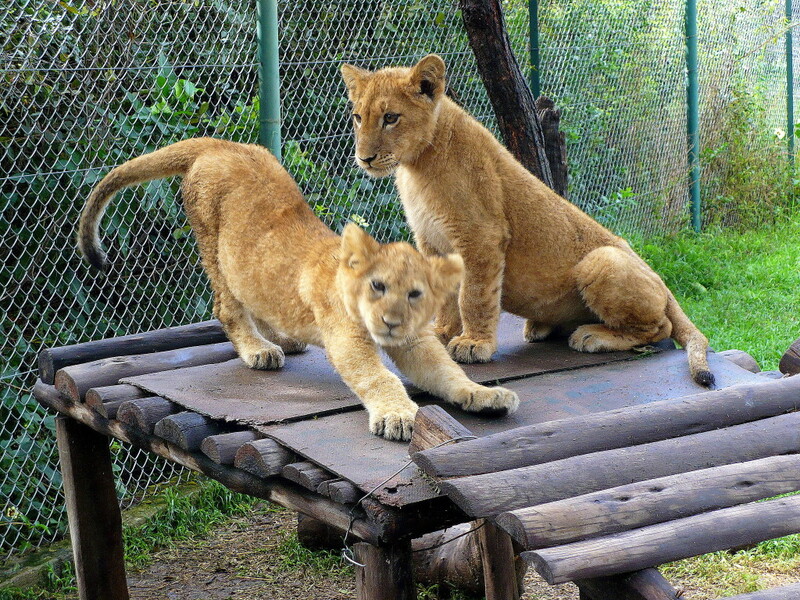 About the lion cubs: when I was there we received two cubs who were abused by humans and we were trying to make them trust people and also get used to hunting. In the park we were also taking lions for a hunt at night to make them used to the fact that they do need to hunt for their own food as adults. Unfortunately, if you let the lions roam freely they when they’re cubs they will be in danger of stupid humans capturing them for whatever reason. After the cubs turn 2 years they retire from walks and the ark releases them when they’re ready – I actually witnessed a release of a few lions. People who work there (mostly locals) are really loving the lions and they do this job for $2 a day so, they’re clearly not doing this for money. But I obviously understand you concerns, I’d be concerned too if I just heard about it. About the elephants: they walk freely in the park and when they were coming to us for food we were taking them for a swim which involved getting on them for like 5-10minutes. However, there was obviously no bench or anything to sit on and the guide with horrible metal horn like they do in Asia. To be fair it was more cleaning their poop then riding haha! I had similar questions as Kathryn after reading this. However, I am still unsure of a few things – I know from orangutans that humans can actual teach and show them how to gather food, swing around, etc. Is the same true for lions? Does a lion cub needs to be taught by humans? Why would or should they learn how to trust humans? Sure they may be hunted, but that cannot be good enough reason to get them more used to humans and keep them enclosed. I actually did do a lion walk with Lion Alert in Zambia. In hindsight I wonder if that was a good idea. Because there is a difference also between volunteering somewhere or just paying money to have your picture taken with a lion even if he is roaming free. I like how you addressed the issue, but somehow I am still not convinced that some aspect of these projects are a good idea for the animal. Thanks Anna. That is reassuring. Sadly I’ve heard so many bad things about so called animal sanctuaries in both Asia and Africa that I’m super suspicious of them all now. I don’t like feeling so cynical but I guess it’s a symptom of the world we live in. i seriously would expect better from someone so educated. paid volunteer program to go to africa and pet lion cubs is one of the worst way to support cunned hunting industry so these little lions are by now probably dead due to foreign hunters. very naive to think that you can release captive bred lions into the wild and does not require much research to find out why. they havent had a successful lion release into the wild, only into bigger enclosers. the program runs for already 20 years and they have admitted in 2014 not to release any lions into the wild so far. are people this obssesed with the idea of petting small lions that they would justify projects which allow to take cubs away from their mothers and being hand raised? for what reason may that be if not for making profit? why on earth would it be necessary to take the cubs away and constantly offer cub-petting volunteering programmes? the mothers are dead? the pride may hurt the cubs? is this such a constant situation that requires volunteers from abroad to pay and pet the cubs? how stupid one must be to believe this bulshit. Unfortunately you have no idea what you’re talking about. If you did you’d know that I witness the release of many lions and the program also rescues injured lions! Not all sanctuaries are as bad as the Tiget Temple in Thailand – wake up people and use some logic! btw. do not confuse releasing lions into big enclosure with releasing lions into the wild. none of the lions have been released to the wild and as Dr. Luke Hunter commented on your park: ““They’ve spent however many millions of dollars charging folks like you to go and cuddle their lion cubs and they haven’t released a single lion.” . Here is also what antelope park replied to the question on trip advisor: “Yes, we haven’t YET successfully released a lion into the wild”… so… what releases have you seen exactly? Talking of salaries…those lionhandlers( fantastic guys) work very long hours and should be payed better. Mr C earns a Lot of money on us naive volunteers…we are told a story and by the end of the 4 weeks, overwhelmed by the beautiful lions, the fantasitic walks and the time spent with them, our specific questions are never answered…if only the money went into the right places. I do believe the lions can do it! They have proved it many times, that they can manage on their own despite being handled by humans. Their Cubs that hasn’t been touched are the ones to be released, if any. Politics and money rules sadly. If only they had made more release enclosures! So that the easily bred cubs could get going! And the 180 odd lions could get a sniff at least of the good life, even though in captivity. So; no more AP volunteers Means no more Cubs to just end up at breeding program. Captive bred lions have been released. Here is a video of a recent release in South Africa. Is Zimbabwe safe for travelling woman? I am a Zimbabwean and I have visited Antelope Park a few times with family and friends from around the world. I do like the place, so much to see and do. I have never volunteered there so not 100% sure what happens but I do believe that they are doing good things at AP.